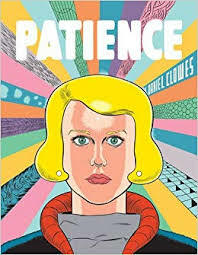 Daniel Clowes’ 180-page vibrant science-fiction graphic novel, Patience, is a love story for the ages. Shortly after finding out she was pregnant, Patience is killed by a mysterious stranger. After spending decades lamenting his lost love, Jack discovers a way to time travel and launches on a journey to save Patience. What he finds is a dark and mysterious past that only makes him love her more. Jack learns about Patience’s history with violent men, her white trash emotionally stunting upbringing, and her affinity for trouble. His love for her so intense that he cannot stop trying to save her, to change the course of her life, to put a stop to these terrible events. What happens is a turbulent adventure of time jumps and heartache. Daniel Clowes is a new American master of visual storytelling, and his vibrant style stimulates the reader while telling a perfectly crafted story. I was engulfed by the images of this sci-fi time travelling tale of love and devotion. I eagerly devoured the entire graphic novel in one sitting, brought nearly to tears as Jack struggled with the decision to change the course of the events or to live with his mistakes and spend the rest of his days longing for a life of love that could never be. This journey was both heartfelt and exciting, a perfect wedding of art and fiction.